Undoubtedly, one of the fan’s favorite Rams is rising senior Torey Burston. It doesn’t hurt that he’s a local guy but it’s really his personality and appreciation of the game that makes him such a likable person. 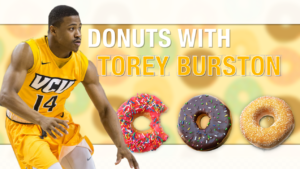 Burston joined us recently for a segment we’re calling, appropriately, ‘Donuts with Torey’. We get down to the serious stuff. What’s his favorite donut? Where is his go-to spot? Sweets vs savory? We also talked to him about the incoming freshman class and what advice he is passing along now that he is entering his senior year.